Holy Guacamole! 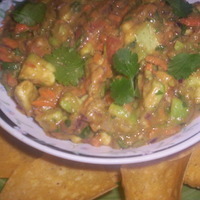 Run of the mill guacamole is taken over the top with a little spicy reinforcement from salsa. Tomatoes add garden fresh flavor and are rich in lycopene. Grated carrot adds an element of crunch and texture, not to mention beta-carotene and fiber, while Sriracha seals the deal. If you love guacamole, you'll be hoppin' with joy over this recipe! Delicion! Cut tomato into quarters and scrap out seeds with a spoon or gently squeeze. To prep avocado, cut lengthwise around diameter. Gently twist to open. Using a sharp knife, carefully strike the pit and turn in hand until seed dislodges. With a large spoon, run down and around inside of skin to remove whole fruit. Roughly chop and toss with lemon juice. Add remaining ingredients and fold together. Season with kosher salt and pepper to taste. Transfer to a chilled bowl or shallow dish and serve with tortillas, baked pita chips or tacos! This recipe is super-fresh and amazing. My finicky younger sister thought it was delicious as did the rest of the test crew. This recipe works equally well with Meyer lemons.